Although Leitz/Leica still camera lenses, particularly the Leica-R series, had been adapted to cine use for many years, in the past there was never a purpose-built Leica cine lens set. That changed with the introduction of the Leica Summilux-C lenses, which are manufactured by Leica’s new cine lens division, CW-Sonderoptic. 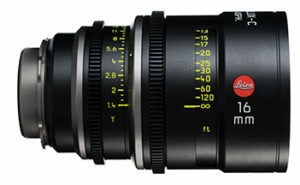 Summilux is Leica’s name for prime lenses with f1.4 or larger maximum aperture. The -C suffix indicates that these are purpose-built cine lenses. The Summilux-C are high-end cost-no-object lenses offer the highest level of optical performance available in a spherical prime lens set. This is the first cine lens set to utilize aspherical elements in every focal length, and to use multiple aspheric elements in some focal lengths. The Summilux-C are also image-space telecentric and have a relatively large 33mm image circle making them compatible with sensors larger than Super 35mm. The unique focus scales of the Summilux-C, made possible by a non-linear focus cam design. The focus scales not logarithmic like traditional focus scales (where the distance on the scale between equally distance spaced marks grows smaller as the scale approaches infinity). For example, on a traditional lens focus scale for a lens using a helical thread focus system, the distance between 2′ and 4′ marks will be far greater than the distance between 10′ and 12′. This is called “focus scale compression” and is an unavoidable problem when using helical focus threads which must have a linear rate. The consequence of this is that in the range where most photography takes place, there is limited resolution on the focus scale, making focus pulling difficult, especially at large apertures such as T1.4. The solution in the past was to allow for as much focus rotation as possible and enlarge the lens focus barrel to accommodate an expanded focus scale. The extended rotation has no real drawback, but the enlarged focus scale diameter results in a much larger lens. CW-Sonderoptic developed a non-linear cam that allows for the marks between 6′ and infinity to be equally spaced on all focal lengths in the Summilux-C set. This is a feature unique to these lenses. This allows for the lenses to have relatively compact external dimensions with a 95mm front ring, while still having a very usable focus scale. In choosing between those two high-end lens sets, rather than splitting hairs regarding MTF, I would advise cinematographers to look at the intangibles: Color quality, bokeh, etc. Each lens set has a distinct personality. CW-Sonderoptic also introduced a T2.0 prime lens series, the Summicron-C. Summicron being Leica’s name for prime lenses of f2 or larger (but less than f1.4) aperture. The Summicron-C lenses are more compact and lightweight than the Summilux-C. Although designed by the same team, they do not incorporate all the high-end features of the Summilux-C (such as multiple aspheric elements or a non-linear focus cam). Consequently the Summicron-C cost significantly less than the Summilux-C, which are among the costliest spherical cine lenses on the market. Although my testing of the Summicron-C lenses has been limited, my brief test left me quite impressed by their optical performance, specifically the superb level of consistency in the technical performance when moving from one focal length to another. At NAB 2016, 15mm and 40mm Summicron-C primes were introduced. 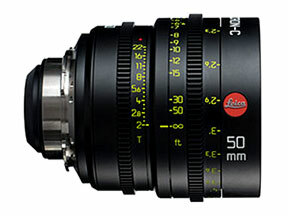 Leica cine lenses are manufactured by Leica’s cine lens division CW-Sonderoptic, and are available exclusively through authorized dealers. This is a new page and will be updated with more information in the near future.